Okay, another mushroom recipe?! Seriously guys, I can’t help it. I’m mushroom o-b-s-e-s-s-e-d! I made these Vegan Stuffed Mushrooms last week for a fun family appy and we ate these tender and juicy mushrooms up in seconds! These Vegan Stuffed Mushrooms are pretty simple to whip up, use the entire mushroom (no wasting the stems here!) 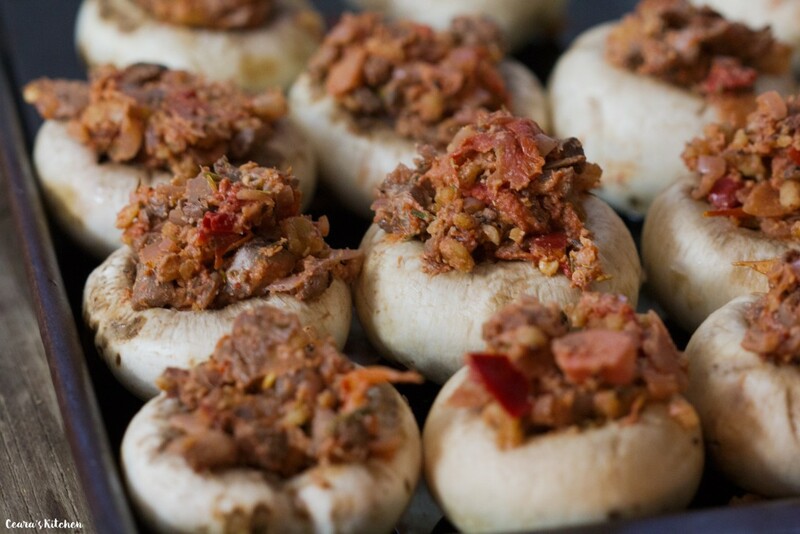 and are filled with a super meaty, tomato-mushroom-walnut stuffing made with hot peppers for a REAL kick! It just started to cool down here and I am loving the crisp, refreshing Autumn air. 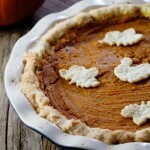 Fall means comfort food, pumpkin, Halloween, boots and Thanksgiving, of course. 😉 We are celebrating Thanksgiving this weekend and we are already planning out the appies, main course and dessert. This Thanksgiving is extra special because it will be J’s first Thanksgiving in Canada! 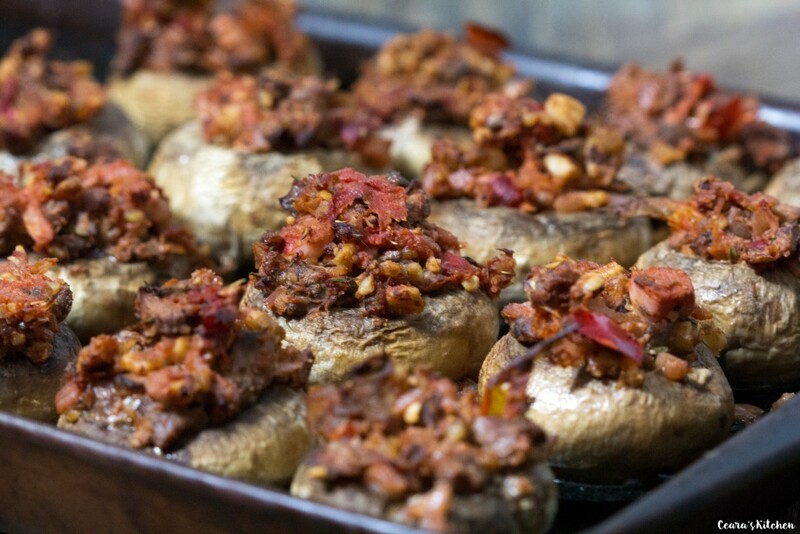 These Vegan Stuffed Mushrooms are going to be one of the appetizers we serve for the holidays. 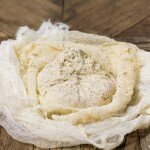 They are SO incredibly flavorful and are the perfect food to serve for a party or family get-together. 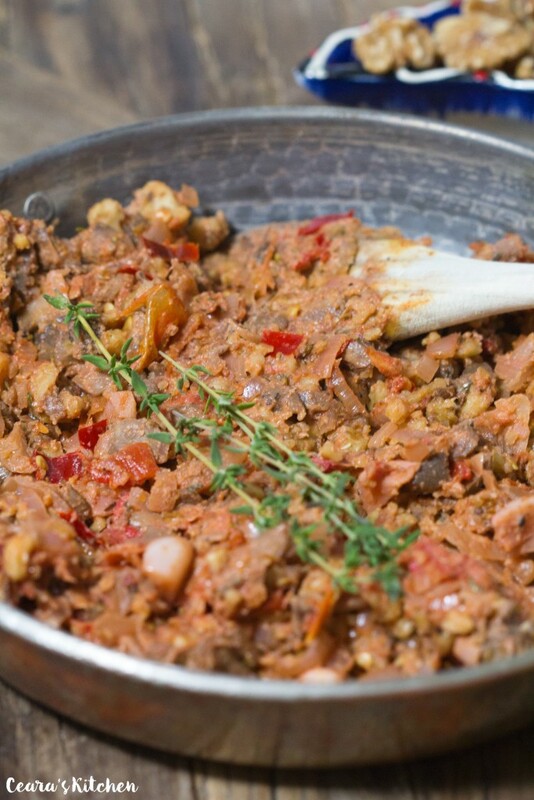 The stuffing is made from sauteed garlic, onion, hot peppers, tomato, mushroom stems, crushed walnuts and herbs. I almost skipped on stuffing the mushrooms altogether and ate the stuffing right then and there! and roasted until perfectly crispy on the outside and soft, juicy and tender on the inside, yum! 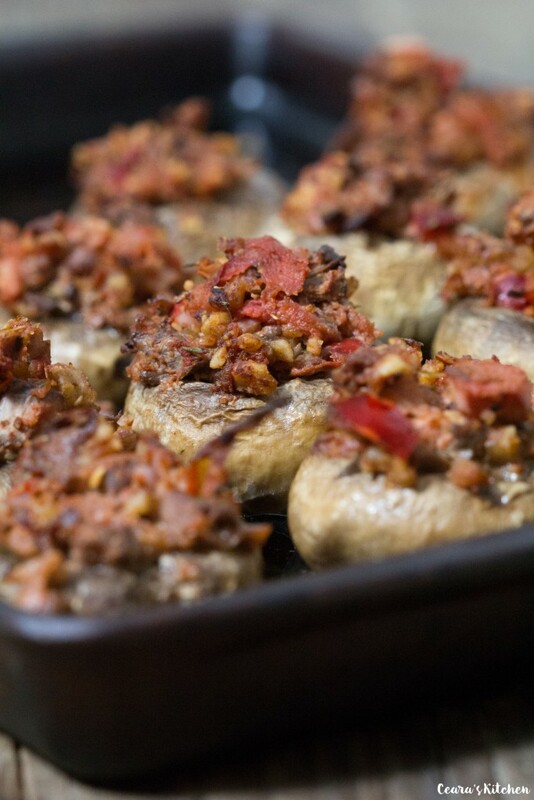 Juicy Vegan Stuffed Mushrooms stuffed with a flavorful mushroom-walnut meat stuffing. The perfect appetizer to serve for a party or get-together! Pre-heat oven to 375F/190C. Remove mushroom stems from mushrooms (do not discard the mushroom stems – you will be using them for the walnut-mushroom meat stuffing). Brush the mushroom caps with grapeseed oil (if using). 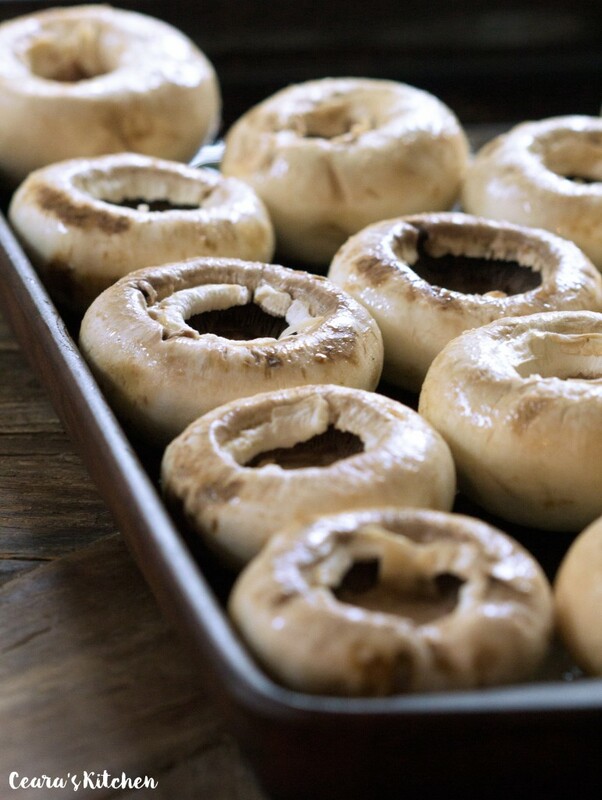 Place the mushroom caps round side down on a lined or lightly oil baking sheet. 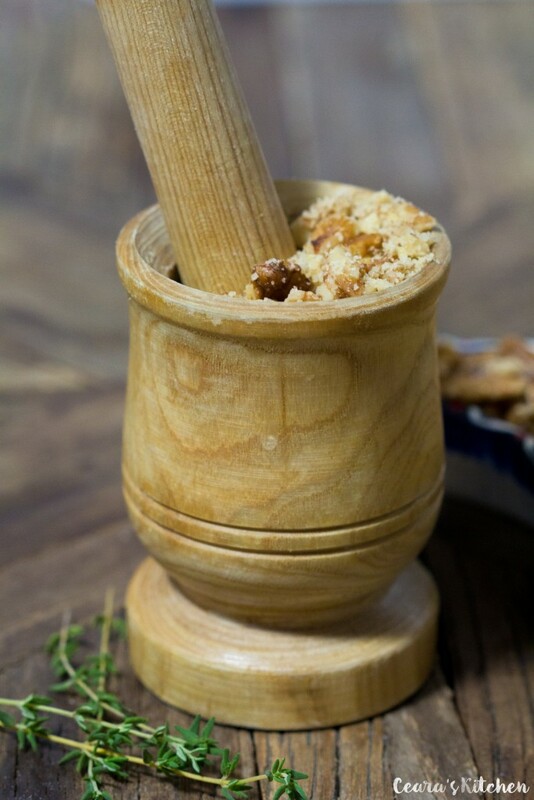 Prepare crushed walnuts by crushing them in a mortar and pestle (see photo) or processing in the food processor for a couple spins until course crumbs form. Do not over process or else the nuts will get too oily! Roughly chop the mushroom stems. In a large pan, over high heat, saute onion, garlic, thyme and herbes de provence with a couple splashes of oil (or splashes of vegetable broth to keep this recipe oil free) until the onions and garlic have softened. Add tomato and mushroom stems to the hot pan. Saute for a couple of minutes until soft. Add crushed walnuts, nutritional yeast and hot peppers to the pan and saute for another couple of minutes. Season with sea salt and black pepper to taste. Stir in nutritional yeast. Stuff the mushroom caps with the mushroom-walnut stuffing (see photo). Bake in the oven for 16 – 20 minutes until the mushrooms are slightly crispy on the outside and tender on the inside. Serve warm as an appetizer! 1) Leave out grapeseed oil to keep this recipe oil free and use vegetable broth to saute the vegetables. 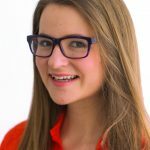 [br]2) Adjust hot peppers based on how much of a kick you like! Could you sub the fresh thyme for dried? or is there another fresh herb that could work too? Having trouble finding fresh thyme where i am! I’m not sure what nutritional yeast is and if I can substitute something else. Advice, please. The nutritional yeast adds the “cheesy” flavor to these stuffed mushrooms. You can leave it out and they will be less cheesy but still delicious! Thank you for the tasty vegan stuffed mushroom recipe. 😄 It was enjoyed at our Livestrong graduation. I was really on the mood for these. I personally could have crushed the walnuts finer. I can’t wait to serve them at our next party with family. I made these for a party and they were a huge hit! I had enough of the stuffing left over that I used it to make stuffed shells with a spicy marinara. So amazing! My husband couldn’t believe how “meaty” it was! Keep the recipes coming, girl! I’m mushroom obsessed too! And I’m always looking at stuffed mushroom recipes but they’re never healthy or vegan, so I’m stoked to try yours. Sounds like you’re having a good time re-discovering Toronto. I’m happy for you! OMG Are these mushrooms stuffed with actual vegans in them? Tasty cannibalism! HEHE, yes they totally are! Thanks Levan! Oh and I’ve been to Toronto last year. It’s such a gorgeous city! 🙂 We’ve been there in late March/early April and lake Ontario was still partially frozen! 🙂 Thank you, Howie!! I appreciate it! I enjoy Thanksgiving with family and friends! I always love to served something new and your stuffed mushrooms sounds real flavorful. I’m pinning for later. I love this recipe!! Mushrooms are one of my favorite things and stuffed is just amazing!! These look absolutely amazing! I’m mushroomed obsessed too. These look so amazing. Congratulations on your new job! I love stuffed mushrooms or mushrooms in any dish for that fact! These look really yummy 🙂 Pinning! I am mushroom obsessed too! I adore them and this recipe looks delicious. I love the addition of hot peppers too. Perfect! I’m obsessed with mushrooms too, and I love that your recipe is vegan and gluten free. Can’t wait to try! These look so good! Stuffed mushrooms are one of my favorite things! LOVE this “meaty” filling. The perfect party food! 🙂 Thank you so much, Jenn!! These look so filling and yummy! I love the idea of using walnuts to lend a meaty texture! The walnuts def. do add a meaty texture 🙂 Thank you! Congrats on the new job and being back in your hometown! These mushrooms look awesome, the tomato in the filling sounds really different and delicious! I would say they would be a great Thanksgiving side dish, but actually I could see them as a vegan thanksgiving main even! Thank you so much, Natalie 🙂 I would love them as a Thanksgiving main too – what a fun idea!